The Pink Panther 1964 - 113 min. 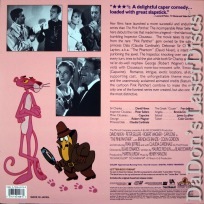 - Color Genre: Comedy Not Rated Country: USA LaserDisc Movie Storyline: The first in Blake Edwards's series of enormously successful Pink Panther films, it introduced Peter Sellers in the role of epic bumbler Inspector Jacques Clouseau. Ultrasuave jewel thief Sir Charles Lytton (David Niven), aka the Phantom, is in hot pursuit of the Pink Panther, one of the world's most precious jewels, now in the possession of Princess Dala (Claudia Cardinale). Clouseau, a detective who has raised bungling incompetence to an art form, is in hot pursuit of Sir Charles, who has successfully eluded him for the past 15 years. He also seeks the Phantom's female accomplice, little realizing that she's actually his own wife, Simone (Capucine), who naturally prefers to sleep with the dashing thief. To complicate matters, Lytton's nephew George (Robert Wagner) arrives on the scene, dismaying his uncle with his desire to follow in his footsteps. When, during a costume party at the princess's Roman villa, the safe containing the Pink Panther is opened, it contains only a white glove--the signature of the Phantom. Sellers, playing a character part with relatively little screen time, stole the film so completely that he went on to star in the series' subsequent installments. The marriage of his comic brilliance with Edwards's mastery of farce made THE PINK PANTHER a huge worldwide hit. The suavely amusing pink cartoon panther featured in the opening and closing credits went on to became the star of his own cartoon show. LaserDisc Movie Review: In the first in a series of detective comedies from director Blake Edwards starring Peter Sellers as bumbling French Inspector Jacques Clouseau, the mishap-prone snoop is actually a supporting player. David Niven stars as Sir Charles Litton, a suave jewel thief known as "The Phantom." Vacationing in a deluxe Alpine resort, Litton's real purpose is to purloin the Pink Panther, a gem of enormous worth owned by a princess (Claudia Cardinale). On his trail for years, Inspector Clouseau keeps losing his quarry, perhaps because his wife Simone (Capucine) is Litton's lover and alerts him every time her husband draws near. Also after the Panther is Litton's American nephew, George (Robert Wagner). At a posh costume ball at the princess' villa, the bauble is stolen and Clouseau, still trying to determine the bandit's identity, is framed for the crime himself. 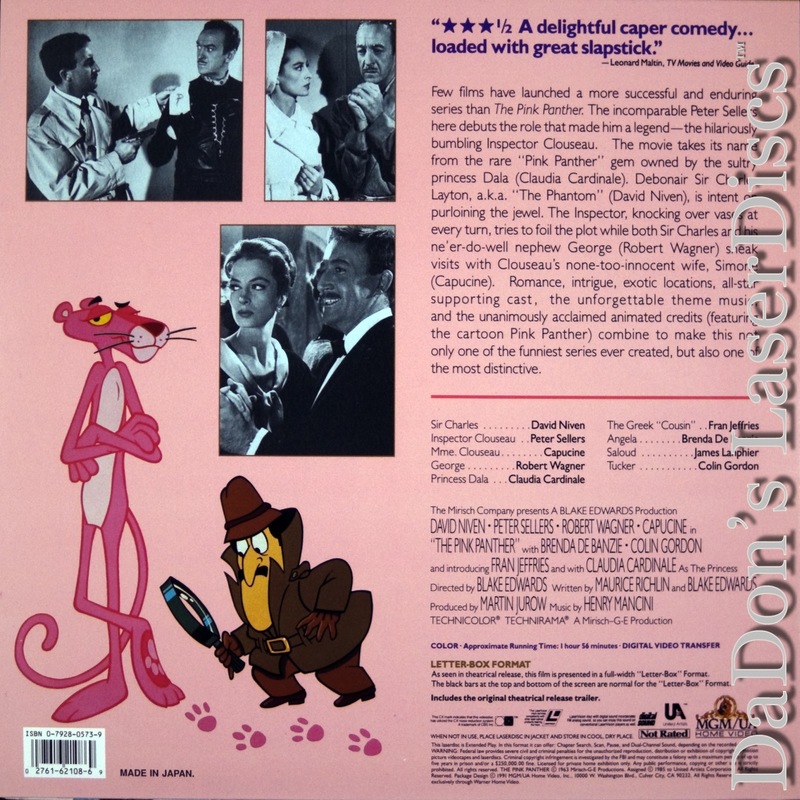 The Pink Panther (1964) made Sellers and his Clouseau act so popular that the character moved to center stage in a series of farcical sequels. --- Karl Williams One of the most successful franchises of the 1960s and 1970s, director Blake Edwards' Pink Panther movies were a hit from their first installment, in 1964. 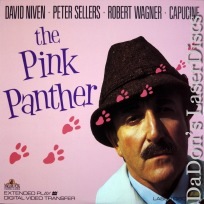 The film introduced many of the series' hallmarks: Peter Sellers' endearingly inept Inspector Clouseau; the lanky animated pink panther of the credit sequences; and Henry Mancini's instantly recognizable score. Clouseau is a more minor role here than he would be in the future. Sellers' scene-stealing work in a part originally intended for Peter Ustinov secured him starring status in the subsequent films. His sense of comic timing is unparalleled, in both dialogue delivery and physical humor. Though The Pink Panther isn't as funny as its sequel, A Shot in the Dark (also from 1964), Edwards gives the screwball humor an effortless feel. Such farce was a departure for Edwards, previously best-known for the bittersweet Breakfast at Tiffany's (1961) and the somber Days of Wine and Roses (1962). The Pink Panther would be followed by eight sequels of varying casts and quality and a popular television cartoon. --- Brendon Hanley Thanks for Visiting DaDon's Rare LaserDiscs ! Reviews, Articles, Newsletter and Information for Movies on LaserDisc LD Laser Disc, LazerDisc.